NEWBERRYTOWN, Pa.: It’s been an Edkin Family Affair through the early stages of the season at BAPS Motor Speedway. A week ago, Kenny Edkin dominated the Opening Day field and collected the victory. That wasn’t the case Week 2, as Edkin was involved in a red-flag period and wasn’t around at the end of the 25-Lap A-Main. But, his brother was front and center. 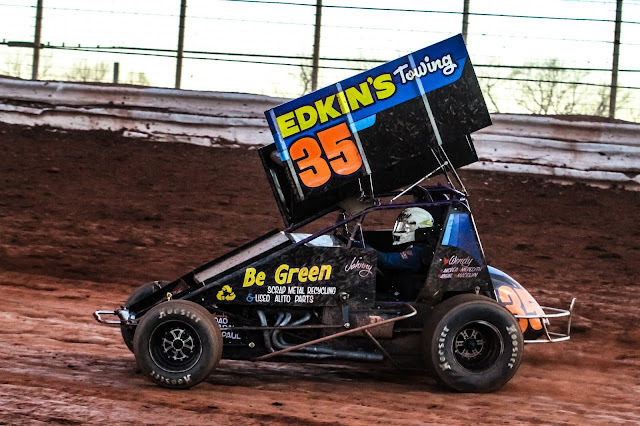 John Edkin, who has been in the BAPS Paint Super Sportsman division for a little over a year, carried the family banner by leading every lap to collect his first career win at the Newberrytown oval. “I didn’t expect to win this quick, not at all,” Edkin said. “The Super Sportsman division is a very, very competitive division. Randy Stout won the Late Model feature, with Greg Diehl taking top honors in the Street Stock division. Travis Horan and Joe Brown collected wins in the Extreme Stock and Classic Car main events. As for Edkin, he started on the pole and was pinned on the bottom of the tricky speedway throughout the feature event. Edkin jumped out front at the start, but it was tough to get a rhythm with four cautions and two red flags in the first six laps. The worst incident came on a Lap 5 restart when Kenny Edkin and Rich Eichelberger flipped in Turn 3. On the next restart, Bruce Buckwalter also got upside down. The final stoppage came on Lap 6, when Steve Fannasy spun. Edkin led Russ Mitten on the restart and continued to be flawless in the low groove. “My crew chief, Don — he works on both cars but primarily on Kenny’s — that was all his deal,” Edkin said. “It was kind of hard the way I had to enter the corner. “The double-file restarts were a challenge, and the veteran [Russ Mitten] kind of rolled me on the start and got in front of me. But, that’s what he is supposed to do. Edkin didn’t have to worry about another restart over the last 20 laps. He went untouched and was able to keep the competition at bay. Mitten held on for second, with Frankie Herr, Garrett Williamson, and Scott Dellinger completing the top five. Paul Miller was the hard charger, storming from 19th to sixth. Kenny Edkin and Steve Fannasy were heat winners for the 20-car field. In the Creekside Auto Sales 358 Late Model feature, Stoudt got past Chase Billet on the final circuit to claim the 20-lap victory. Billet started third on the grid but was in front of the field by the completion of Lap 1. Stoudt started fourth and wasted little time getting into the second position. The main event featured six caution periods, which set up a thrilling finish. Stoudt rocketed to the outside of Turn 2 on the final lap and pulled ahead of Billet. He led the final half lap to claim the win. Billet settled for second, with pole-sitter Charles Potts, Alan Sagi, and Sean Merkel completing the top five. Stoudt and Billet were heat winners for the 22-car field. Diehl was the last of four different leaders in the 20-Lap Morgan Paving/Aqua Fun Pools Street Stock feature, leading the final 10 circuits. Will Walls took the top spot on the initial start before Ryan Smith wrestled the lead away on Lap 5. Walls regained the advantage on Lap 6, but Diehl took control on the 10th circuit. Walls was second. Brian Walls, Eric Tripp, and Smith completed the top five. Will Walls and Smith were heat winners for the 17-car field. Horan was the class of the Superior Homes Extreme Stock 20-lapper. He took the lead from Patrick McClane on Lap 5 and never looked back. Sam Rial, Matt Adams, Donnie Broderick, and Johnny Palm completed the top five. McClane and Rial were heat winners for the 15-car field. Joe Brown led the final five laps of the Classic Car main event. He started second and took the lead from Roland Brown. Roland Brown finished second, with Chad Stine, Wes Brown, and Jim Rost completing the top five. Joe and Roland Brown were heat winners for the 13-car field. Feature (25 Laps) – 1. 35-John Edkin; 2. 77-Russ Mitten; 3. 70D-Frankie Herr; 4. 32-Garrett Williamson; 5. 30-Scott Dellinger; 6. 58-Paul Miller; 7. 1A-Chase Gutshall; 8. 20W-Davey Walsh; 9. 5D-Luke Deatrick; 10. 2M-Matt Ondek; 11. 7-Timmie Barrick; 12. 10H-Dave Hollar (DNF); 13. 318-Jay Fannasy (DNF); 14. 83-Bruce Buckwalter Jr. (DNF); 15. 75-Kenny Edkin (DNF); 16. 8-Rich Eichelberger (DNF); 17. 23-Justin Foster (DNF)(Artwerks Hard Luck Award); 18. 14-Nate Young (DNF); 19. 3B-Mike Enders (DNS); 20. 71K-Tyler Wolford (DNS). No time. Super Sportsman Heat 1 Finish (10 Laps/All Qualify) – 1. 75-Kenny Edkins; 2. 77-Russ Mitten; 3. 32-Garrett Williamson; 4. 1A-Chase Gutshall; 5. 20W-Davey Walsh; 6. 14-Nate Young; 7. 2M-Matt Ondek; 8. 3B-Mike Enders (DNF); 9. 10H-Dave Hollar (DNF); 10. 58-Paul Miller (DNF). No time. Super Sportsman Heat 2 Finish (10 Laps/All Qualify) – 1. 318-Jay Fannasy; 2. 8-Rich Eichelberger; 3. 35-John Edkin; 4. 70D-Frankie Herr; 5. 30-Scott Dellinger; 6. 7-Timmie Barrick; 7. 23-Justin Foster (DNF); 8. 5D-Luke Deatrick (DNF); 9. 71K-Tyler Wolford (DNF); 10. 83-Bruce Buckwalter Jr. (DNF). No time. Feature (20 Laps) – 1. 12-Randy Stoudt; 2. 22-Chase Billet; 3. 5-Charles Potts; 4. NINE-Alan Sagi; 5. 118-Sean Merkel; 6. 116-Travis Mease; 7. 72-Wayne Pfeil; 8. 21M-Matt Murphy; 9. 13X-Ben Whitaker; 10. 88C-Chuck Cox III; 11. 9-Matt Adams; 12. 21-Joey Hoffer; 13. 60-Bobby Beard; 14. X4-Lou Egrie; 15. 37B-Brandon Eveler; 16. NINEX-Ross Leinbach; 17. 0-Deshawn Gingerich (DNF); 18. X-Bernie Beard (DNF); 19. 711H-Jennifer Hartz (DNF); 20. 711E-Todd English (DNF); 21. 32-Brad Bingaman (DNF); 22. 19-Dan Hoffman (DNF). No time. Late Model Heat 2 Finish (8 Laps/All Qualify) – 1. 22-Chase Billet; 2. 5-Charles Potts; 3. 116-Travis Mease; 4. 9-Matt Adams; 5. X4-Lou Egrie; 6. 21M-Matt Murphy; 7. 21-Joey Hoffer; 8. 711E-Todd English; 9. 32-Brad Bingaman; 10. 711H-Jennifer Hartz (DNF); 11. 60-Bobby Beard (DNS). No time. Feature (20 Laps) – 1. 80D-Greg Diehl; 2. 21W-Will Walls; 3. 52-Brian Walls (Artwerks Hard Charger); 4. 43-Eric Tripp; 5. 59-Ryan Smith; 6. 99K-Kody Sites; 7. 91-Dalton Frye; 8. 7P-Jim Palm; 9. 72-Jason Townsend; 10. 11-Craig Morgan; 11. 64-Brandon Wanner; 12. 07-Eric McClane; 13. 14D-Justin Dashler; 14. 99K-Kyle Saylor; 15. M1-Mike Potts; 16. 33-Troy Myers (DNS); 17. 99-Chad Smith (DNS). No time. Street Stock Heat 1 Finish (8 laps/All Qualify) – 1. 21W-Will Walls; 2. 43-Eric Tripp; 3. 7P-Jim Palm; 4. 72-Jason Townsend; 5. 11-Craig Morgan; 6. 14D-Justin Dashler; 7. 33-Troy Myers; 8. M1-Mike Potts; 9. 99-Chad Smith (DNS). No time. Feature (20 Laps) – 1. 21H-Travis Horan; 2. 55-Sam Rial; 3. 18C-Matt Adams; 4. 97-Donnie Broderick (Rehbein’s Service Center Hard Charger); 5. 7JR-Johnny Palm; 6. 15-Jeff Gill; 7. 11-Brandon Staccone; 8. 1A-Scott Arnold; 9. 98-Richard Daughtrey; 10. 6G-Gordie Marshall; 11. 17-Brian Blank; 12. 91-Will Long; 13. 21A-Patrick McClane; 14. 25-Andrew Hogue; 15. 8-Roger Rhodes. No time. Extreme Stock Heat 1 Finish (8 Laps/All Qualify) – 1. 21A-Patrick McClane; 2. 21H-Travis Horan; 3. 7JR-Johnny Palm; 4. 15-Jeff Gill; 5. 91-Will Long; 6. 6G-Gordie Marshall; 7. 97-Donnie Broderick; 8. 17-Brian Blank. No time. Extreme Stock Heat 2 Finish (8 Laps/All Qualify) – 1. 55-Sam Rial; 2. 18C-Matt Adams; 3. 11-Brandon Staccone; 4. 1A-Scott Arnold; 5. 25-Andrew Hogue; 6. 98-Richard Daughtrey; 7. 8-Roger Rhodes. No time. Feature (20 Laps) – 1. 89-Joe Brown; 2. 87-Roland Brown; 3. 19-Chad Stine; 4. 86-Wes Brown; 5. 2-Jim Rost; 6. 73-Neal Reamer; 7. 54J-Jimmy Combs; 8. 9-Dylan Brown; 9. 100-Michael Smith; 10. 09-Ron Grove; 11. 56-Lance Grove; 12. 59-Sharon Unitas; 13. 07C-Charlie Summers. No time.